Alright, I'm going to come clean with all of you - so, fasten your seat belts ... Yours Truly does not own an iPad. I know. I know. How can one call themselves a blogger in this day-and-age without owning an iPad? What's worse? (Yes, it gets worse) I don't even have an iPhone. I walk around New York trying to conduct my life on a BlackBerry. When I had the chance to get an iPhone a year and a half ago, I chose not to. I mistakenly thought "Meh, I don't need all of that... straight forward function. THAT'S what I need." I definitely subscribed to the notion highlighted in the latest BlackBerry TV spots "for those who need tools, not toys." So, now I'm stuck waiting until October when my inane and nearly useless AT&T contract / BlackBerry comes up for renewal. Le Sigh. It's a long time until October. No iPhone, no iPad - I feel like I'm standing still while everyone else races past me on the social media race track. Well, just like rubbing some salted lemon juice in an open flesh wound, the Met has released a brand new iPad app - Met Opera on Demand. The app allows unlimited streaming access to video transmissions from the Met’s Live in HD series [yawn], plus hundreds of historic TV and radio broadcasts. Yes, you read it correctly - no need to adjust your glasses - plus hundreds of historic TV and radio broadcasts. The free app, available for download from the App Store, will give opera fans around the world mobile access to high-quality audio and video streams of hundreds of performances from the Met’s 81-year broadcast history. New content will be added monthly, including recent Live in HD transmissions featuring the well known singers of today’s opera world. Live in HD titles will be added to the service two to three months after their premiere in movie theaters. A subscription is required to access streaming content, with plans beginning at $14.99 a month. In it's initial offering, 44 selections will be available from the company’s Live in HD series, including the behind-the-scenes intermission features. The streaming service also allows users access to historic telecasts featuring stars like Luciano Pavarotti, Plácido Domingo, Joan Sutherland, and Leontyne Price. The video library includes historic performances, such as a 1979 production of Don Pasquale starring Beverly Sills or a 1998 Le Nozze di Figaro telecast starring Renée Fleming, Cecilia Bartoli, and Bryn Terfel. All videos include English subtitles and many offer alternate titles in French, German, Italian, Portuguese, Russian, and Spanish. Also, for those of us who realize that in order to know where we're going, we have to know where we've come from ... More than 250 audio performances from Met history are available through the Met Opera on Demand app. Digitally remastered audio streams, beginning with a 1936 performance of Wagner’s Götterdämmerung, starring Lauritz Melchior, are available. And get this, Chickpeas... 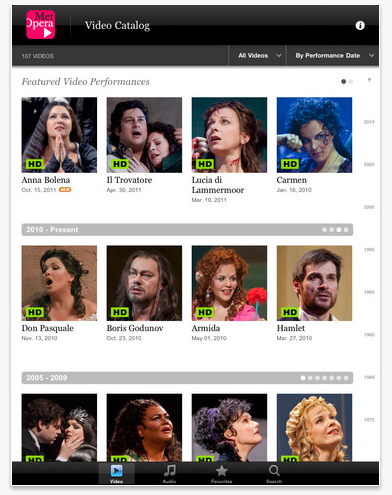 The Met Opera on Demand app includes social sharing capabilities for Facebook and Twitter and provides users with the ability to create favorites lists.